A subcortical circuit linking the cerebellum to the basal ganglia engaged in vocal learning. Ludivine Pidoux Is a corresponding author , Pascale Le Blanc, Carole Levenes, Arthur Leblois / CNRS Paris Descartes. Elife. 2018 Jul 25;7. pii: e32167. doi: 10.7554/eLife.32167. Speech is a complex sensorimotor skill, and vocal learning involves both the basal ganglia and the cerebellum. These subcortical structures interact indirectly through their respective loops with thalamo-cortical and brainstem networks, and directly via subcortical pathways, but the role of their interaction during sensorimotor learning remains undetermined. 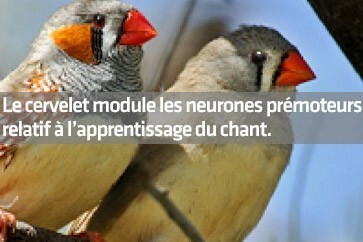 While songbirds and their song-dedicated basal ganglia-thalamo-cortical circuitry offer a unique opportunity to study subcortical circuits involved in vocal learning, the cerebellar contribution to avian song learning remains unknown. We demonstrate that the cerebellum provides a strong input to the song-related basal ganglia nucleus in zebra finches. Cerebellar signals are transmitted to the basal ganglia via a disynaptic connection through the thalamus and then conveyed to their cortical target and to the premotor nucleus controlling song production. Finally, cerebellar lesions impair juvenile song learning, opening new opportunities to investigate how subcortical interactions between the cerebellum and basal ganglia contribute to sensorimotor learning.